Campani is a registered architect in NYS since 1985, Campani worked with the architectural firm Conrad Levenson and Associates, NYC, then had her own practice, Frances Campani Architect. Presently she is a partner in Campani and Schwarting Architects. That collaboration has been distinguished through awards for affordable housing solutions and mixed-use projects. The firm currently works with a number of civic and non-profit groups to improve public space in their communities. She has received several public architectural grants, and recognition in several competitions. Campani’s paintings and pastels have been exhibited both nationally and internationally over the past 25 years. Recently she has participated in exhibitions at the National Arts Club in NYC (Pastel Society annual Juried Exhibition) and an exhibition ‘Art by Architects’ at Gallery V in Columbus, Ohio. She sees her work in painting and architecture as equally important and mutually sustaining. Michael Schwarting is an architect, urban designer and professor. He has a B. Arch. and a M. Arch. in Urban Design from Cornell University and received a Rome Prize Fellowship from the American Academy in Rome. Michael Schwarting was an Associate in Richard Meier and Associates. He has been a principle of Jon Michael Schwarting-Architects, partner in Design Collaborative with Piero Sartogo, and at Karahan and Schwarting Architecture Company. He is presently a partner in Campani and Schwarting Architects - CASA. The public/urban work includes the Master Plan and Campus Walk for the Fashion Institute of Technology in NYC, which received a Progressive Architecture Citation; the Franklin Street IRT Subway Station and Canopy & Bedford Street Improvements in Williamsburg, Brooklyn for NYC PDC; Stuyvesant Cove Waterfront Park Study for NYC CB 6.; Bogardus Triangle Garden for NYC DOT; and Mount Sinai Park and Community Center on Long Island. Recently, he produced and publicly exhibited a plan for the downtown and harbor front of Port Jefferson. His residential-adaptive reuse project on Ludlow Street, NYC was published in Architectural Record – Oct. 2002 and received an American Institute of Architects Long Island Archi Award. CASA also received an Archi Award-Citation for a mixed use project on Main Street in Port Jefferson in 2004. Work has been exhibited and published internationally in journals and books. He has been recognized and placed in several competitions. He has also received private and public grants for architectural and urban research including the Graham Foundation, NEA, three from NYSCA and three NYS grants for the historic reconstruction of the Aluminaire House project. Michael Schwarting has served on the Board of the Architectural League of NYC, the Van Alen Institute and is a Trustee Emeritus of the American Academy in Rome. He is presently a Director on the Port Jefferson BID. 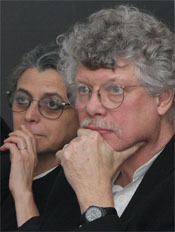 He has lectured internationally, and published numerous articles including; “The Lesson of Rome”, Harvard Review -2, “The Progressive Uses of Tradition”, Precis 2, Columbia University; “In Reference to Habermas”, Architecture Criticism and Ideology, Princeton Architecture Press; “Morality and Reality: In Search of a Better Argument”, VIA 10, U. of Penn. ; “Ulterior Motives: the Possibility of a Second Agenda in Architecture”, Modulus 21, Univ. of Virginia and “The State of the City”, ACSA Rome Conference Proceedings. Jon Michael Schwarting-Architect: Projects 1970-2005 was exhibited at New York Institute of Technology 2005 and Cornell University 2006. Michael Schwarting is a Professor of Architecture and Director of the graduate Program in Urban and Regional Design at New York Institute of Technology. He has also taught at Columbia University, The Cooper Union, University of Pennsylvania, Yale university, Cornell University, The Institute for Architecture and Urban Design and Syracuse University. Peter Dawson has a Bachelor's degree in Architecture from New York Institute of Technology. He has worked with JRS Architect PC as a Project Manager with various corporate clients on many project types, taking projects from programming and conceptual design through construction. He had designed numerous retail bank branches and corporate office spaces. He has designed medical facilities ranging from M.R.I suites to medical and dental offices. He has been a partner in his own design studio based in Greenpoint, Brooklyn. He has also taught Architectural Design at New York Institute of Technology.